The ACACIA Gazebo program offers the enthusiast the ability to extend their covered living area. Our rust free Structural Extruded aluminum frame will last a lifetime. The Electrostatic finish makes the frame even more durable and attractive. The electrostatic finish actually sends an electric charge through the paint and the frame to help cause a chemical (ionic) bond, much stronger that simple powder coating commonly found in imported versions. From our quick assembly sculpted heavy-duty legs that can support over 1000 lbs. each to our unique frame design. We use Sun-DURA branded solution dyed polyester fabrics from Glen Raven Inc. Our factory precision laser cuts each of the canopy tops for the best fit. With 19 total colours available, we are sure that there is a colour to match your exterior and your needs. With a simple design, the canopy can be easily removed during winter months, extremely windy conditions, or for cleaning. Dual canopy design which allows for air circulation and prevention of updraft damage. Built in / hidden anchoring system. Easy to assemble. Our Sun-DURA canopies are UV protected, and designed to resist fading and staining for 7 years. The Sun-DURA Canopies feature accented black trim and black stitch work threading. Expand your outdoor living space with this attractive and affordable cedar gazebo by Monterey. Crafted from select tight-knot cedar, this piece includes a metal cap and wooden finial for a finished look. It also features decorative spindle styling and can be stained and shingled to match your home. (Gazebo shown with optional accessories). Expand your outdoor living space with this attractive and affordable round gazebo by San Marino. Crafted from select tight-knot cedar, this piece includes a metal cap and wooden finial for a finished look. It also features decorative spindle styling and can be stained and shingled to match your home. Shade yourself from the hot summer sun underneath the handsome Agusta Grill Gazebo. Thanks to the easy set-up, you'll get more time to focus on honing your grill skills. The two-tiered vented canopy gives the structure a substantial look and added stability against gusting wind. Plus, the two handy shelves provide ample room for grill accessories, beverages, and/or food. Add a touch of modern style to your outdoor space. The Birmingham Gazebo features an innovative translucent polycarbonate top that allows soft light to filter through the entire roof while still protecting you from rain, leaves, and harmful UV rays. 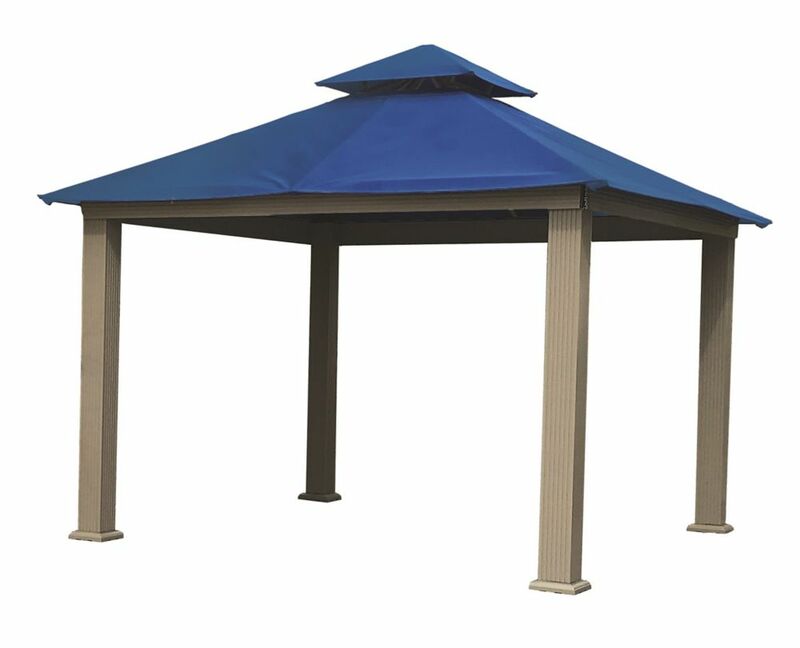 Sturdy square posts and an aluminum and steel frame make this gazebo durable and attractive. 12 ft. Sq. Gazebo -Cobalt Blue The ACACIA Gazebo program offers the enthusiast the ability to extend their covered living area. Our rust free Structural Extruded aluminum frame will last a lifetime. The Electrostatic finish makes the frame even more durable and attractive. The electrostatic finish actually sends an electric charge through the paint and the frame to help cause a chemical (ionic) bond, much stronger that simple powder coating commonly found in imported versions. From our quick assembly sculpted heavy-duty legs that can support over 1000 lbs. each to our unique frame design. We use Sun-DURA branded solution dyed polyester fabrics from Glen Raven Inc. Our factory precision laser cuts each of the canopy tops for the best fit. With 19 total colours available, we are sure that there is a colour to match your exterior and your needs. With a simple design, the canopy can be easily removed during winter months, extremely windy conditions, or for cleaning. 12 ft. Sq. Gazebo -Cobalt Blue is rated 5.0 out of 5 by 1. Rated 5 out of 5 by Kevin from Great product! Easy to setup, great instructions. Looks fantastic as well. Great product! Easy to setup, great instructions. Looks fantastic as well.